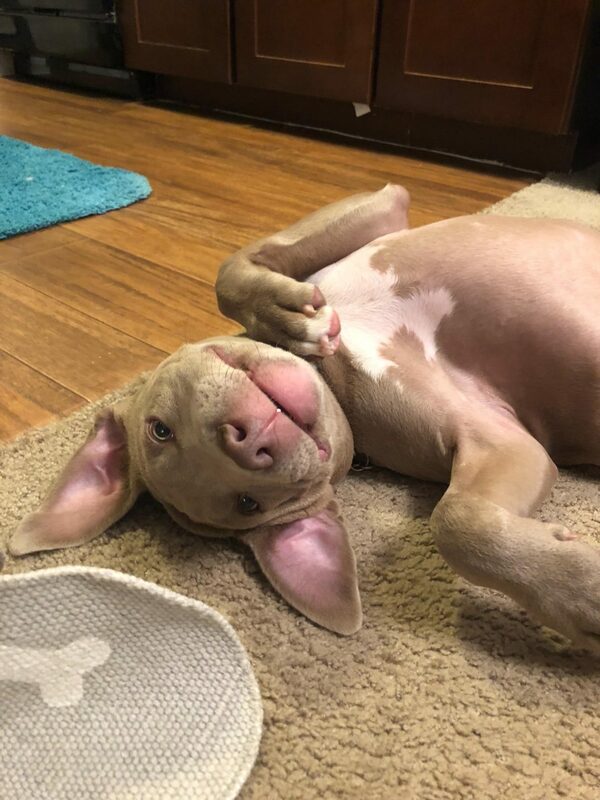 October is National Pit Bull Awareness Month, and at Dog Training Now, we get the honor or working with a lot of really amazing Pit Bull pups and other “bully” breeds. Despite the often unfair breed stereotypes, these pups have the capacity to be incredible family dogs, but as with any dog, early and continuing training is the key to a happy, well-adjusted life. 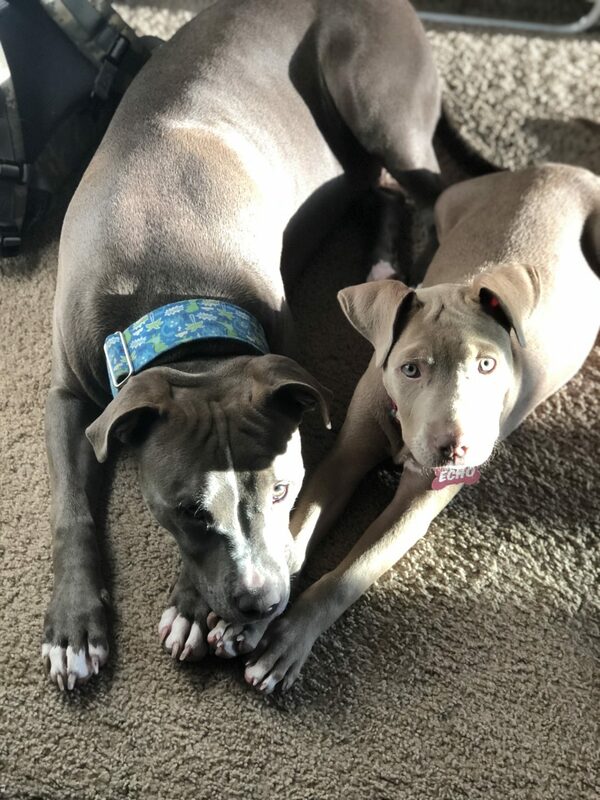 This summer, we got to meet Brenda, Lizzy, and their dogs Blue and Echo, a couple of beautiful blue pit bulls, and we thought it only appropriate to honor them as our October, 2018 Clients of the Month. 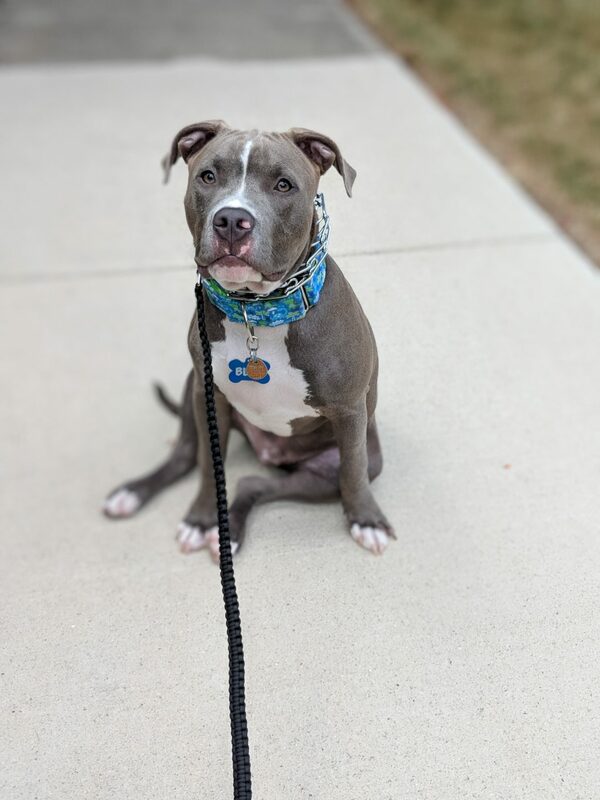 We first met Blue in July as he joined us in our 10-Day Day Training program. The boy was five months old at the time, and he took to training right away! We all fell in love with him! 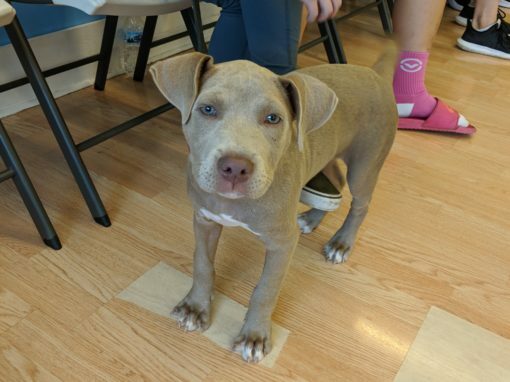 Brenda explained “We got Blue around 4 months old, we actually thought he was a pretty well behaved pup. We weren’t looking for something specific. But rather just basic obedience…so when he grows up, he’s not all crazy”. By the time Blue graduated from training, everyone at Dog Training Now had grown depressed that Blue was going to be moving on, and that we wouldn’t get to see him every day. Thankfully, that depression was short-lived. 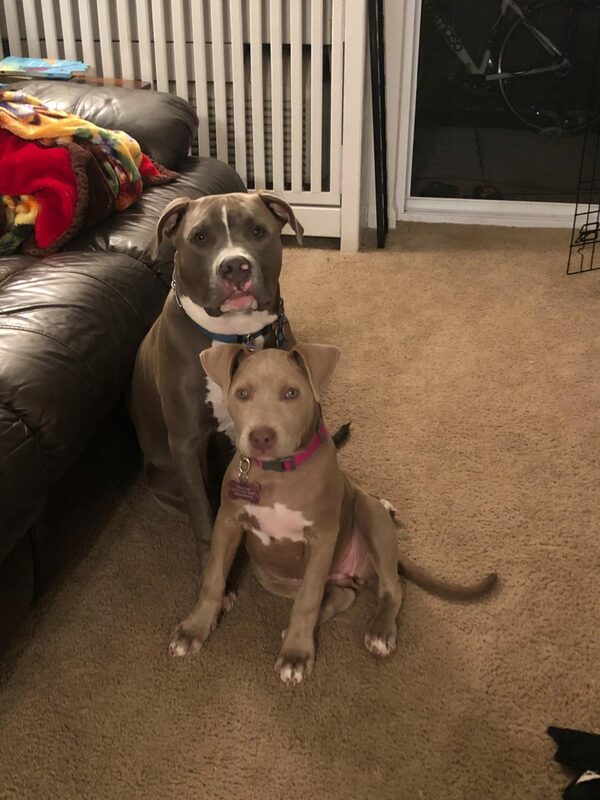 Less than a month after Blue’s graduation, Brenda and Lizzy reached out to us saying that they had just adopted a young blue Pit Bull puppy named Echo. Life was good again! 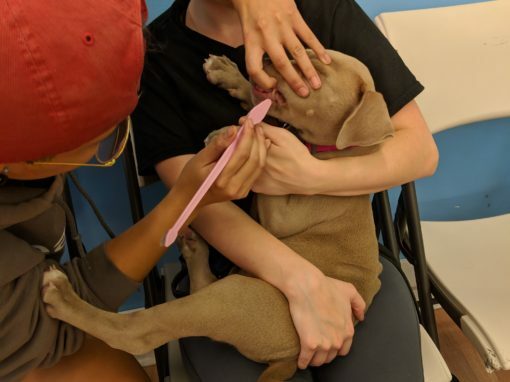 Echo joined us in Puppy Preschool each Thursday evening to build social skills, and for Puppy Day Camp each day to work on potty training, crate training, and socialization. 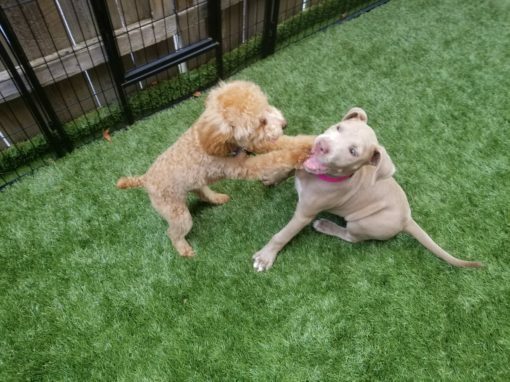 Echo was with us nearly every day between late August and early October, and everyone at Dog Training Now had fallen in love with her, and eagerly anticipating beginning her 10-Day Day Training program when she reached 16 weeks of age. “We got Echo when she was 2 months, and she was more of a jumper than Blue ever was. She listens pretty well, but we wanted her to follow in Blue’s footprints” explains Brenda. 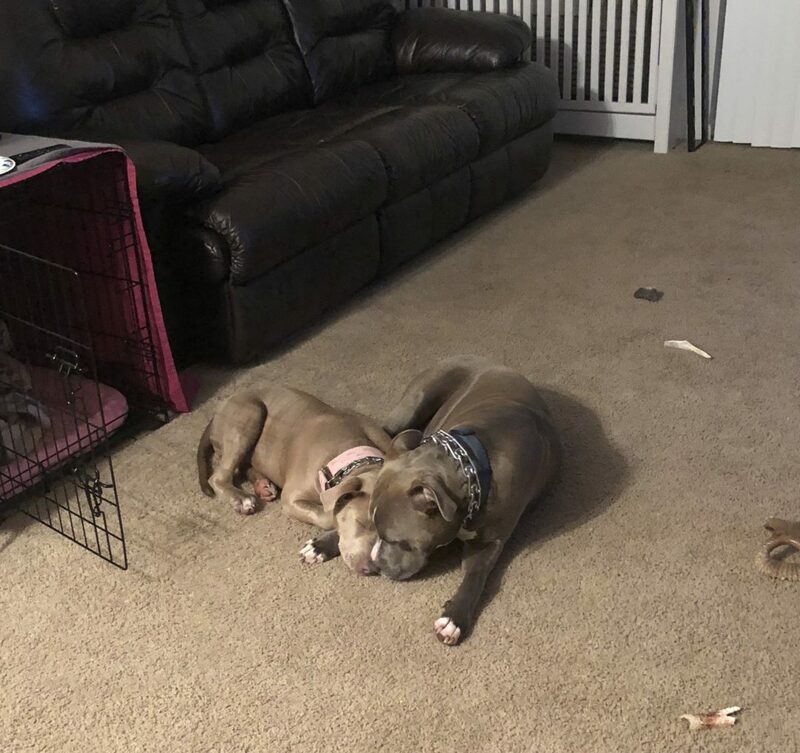 With Echo soon to join her brother as a Dog Training Now alumnus, Brenda and Lizzy have built a really solid relationship with their pups: “I love both my pups! I feel like training really just reinforced that, since they are able to listen well and know right from wrong! I feel like learning these skills really help be able to build a strong bond with our companions.” Brenda said after training. “Aside from just their beautiful looks, we have gotten plenty of compliments about how well behaved our dogs are ‘for being pit bulls’. We actually went to a restaurant that had a patio and strangers asked us if Blue was a service dog because he was just so well behaved and quiet”. 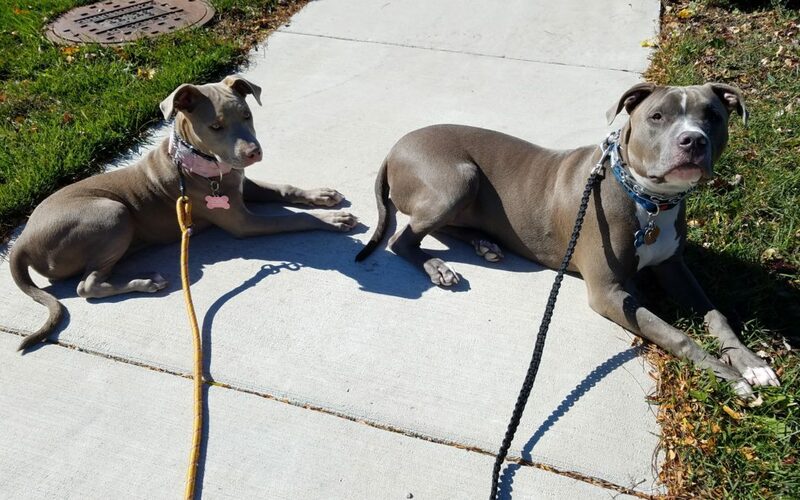 Blue and Echo, as well as their owners, show just how amazing Pit Bulls can be, and how often those breed stereotypes are just so unfair. 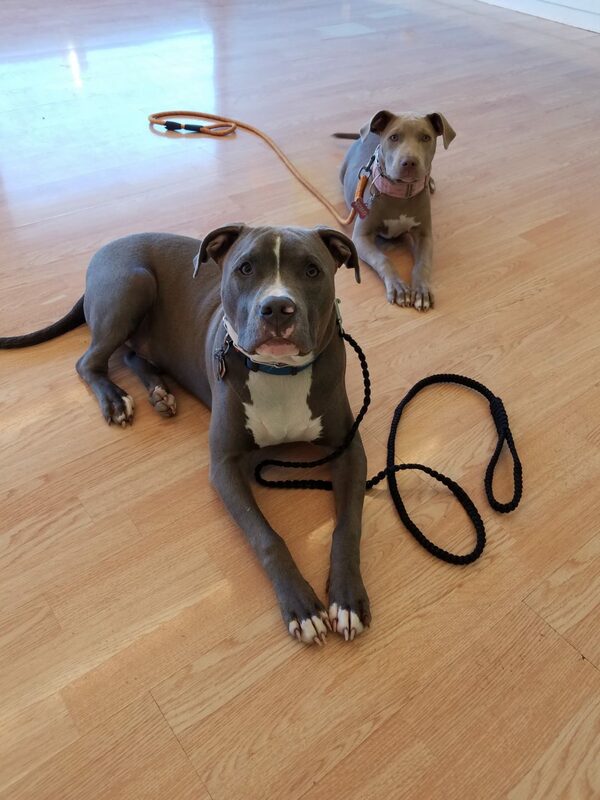 Training and socialization have set these two pups up to have a great life and be amazing members of their home and of society in general! We can’t congratulate Brenda and Lizzy enough on their great work, and we’re so thrilled that they’re getting the dogs that they deserve! At Dog Training Now, we don’t discriminate. We love training all dogs, and every dog, every breed, every age, every size, present their own new and unique challenges and rewards. Happy Pit Bull Awareness Month! Blue and Echo love each other!